Jen and John’s paths first crossed when they met in high school years ago. They reconnected recently and found there was an undeniable connection between them. Their love for one another and their children is what fuels their fires. It’s so beautiful to see how they’ve brought their families together in such a cohesive and loving way. 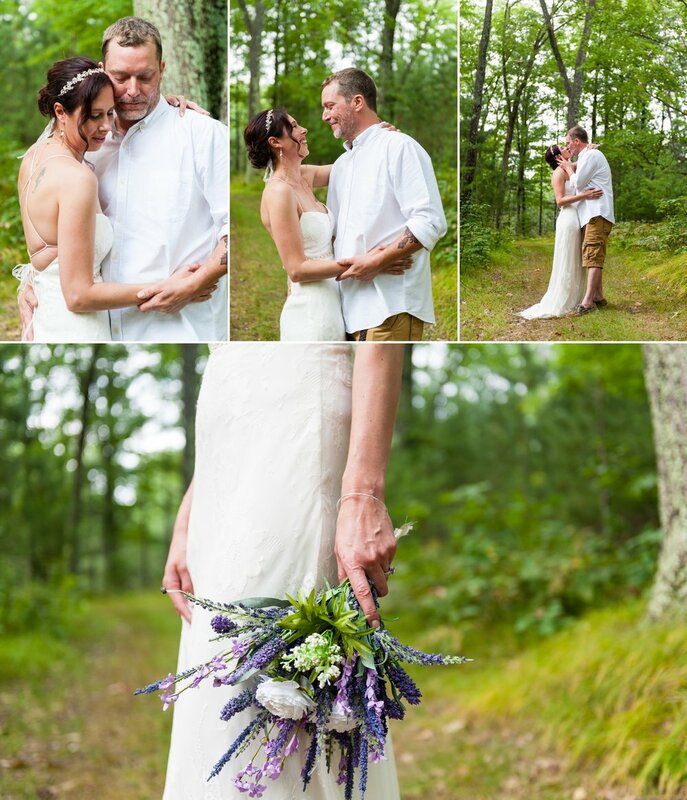 They decided to wed on our grandmother’s beautiful lakefront property in the northwoods of Wisconsin. Jen and I are cousins, and hearing that she chose the Misty Moors property (our affectionate name for our land) as the backdrop of their wedding was incredibly exciting and special. All of us cousins have grown up on that property, swimming in the lake, roaming the woods, and spending time with our families. It was really moving to see Jen and John continue that legacy with their family. Jen’s brother, a Navy service member, captained the boat that gently glided across the lake to the ceremony site along the water. Jen’s aunt (my mother!) officiated the intimate service, celebrating Jen and John and their journey so far. Jen was absolutely stunning in a form fitting boho dress from David’s Bridal, and John gazed at her adoringly in his wedding-casual whites and khakis. Jen’s daughter handmade the bouquets, and talented friends had styled Jen’s hair and makeup. It truly was an intimate experience incorporating some of the most important people in their lives. After sneaking away to the trail that surrounds our property for some intimate woodsy wedding portraits, the guests mingled and dug in to some classic Wisconsin food: burgers, brats, and corn. Can we make this be more of a wedding trend please?? The wedding party and guests changed out of their formal clothes and traded them for swimsuits, flip flops, and floaty toys to bombard the lake with. It was the perfect, beautifully laid-back affair Jen and John had been dreaming of. Jen and John, your love is amazing and it is so inspirational to see how you two care for one another, and your children. You’ve already built a beautiful life, and there are so many more amazing experiences in your future. Cheers to the two of you, and best wishes.